The story of Carmelo’s Brick Oven Pizza is a simple one. With a passion for preparing unforgettable events, Chef Peter Seminara has always enjoyed dazzling his guests with flavor. Born and raised by Sicilian parents, Peter has always been at home in the kitchen. 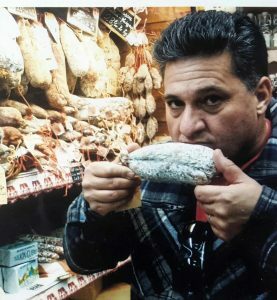 The business is named after his father and grandfather, Carmelo Seminara, who immigrated to the U.S. exactly 100 years ago and was a chef at the renowned Des Palmes hotel in Palermo, Sicily, and for the exiled Duke of Orleans. Today, Peter continues this family tradition and is often helped by his son, Sammy, shown in the photo. 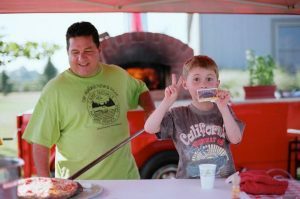 A huge fan of wood-fired, brick oven pizza, Peter was introduced to the concept of the portable, wood fired oven in the Fall of 2009 by a good friend and ex-client, Joe Pergolizzi, who started producing the current Fire Within oven trailers. Peter seized the opportunity and purchased his oven, trained at the Fire Within cooking workshop and opened his doors. The rest is history still being made. . . .